How Obama Hopes To Achieve U.S. Climate Goals Past U.S. leaders tried to commit the nation via treaty to steep cutbacks in greenhouse gases. But without congressional support, those pledges fizzled. President Obama is trying regulation, instead. 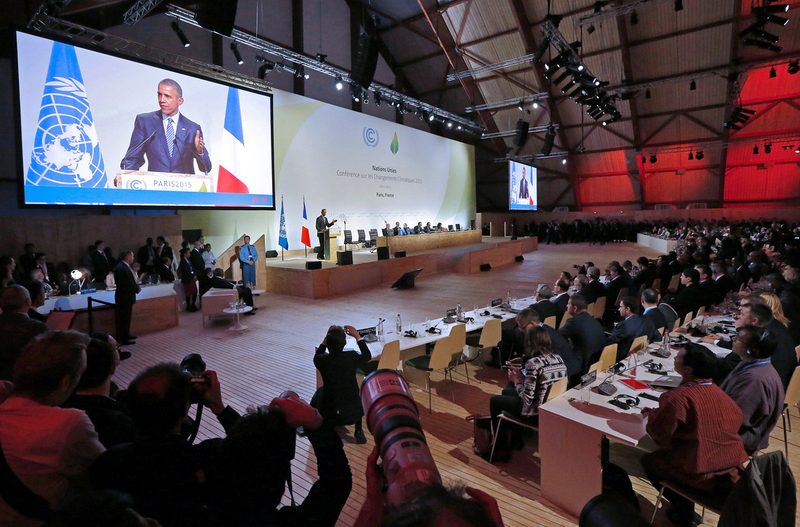 President Obama attended the plenary session of the international climate conference Monday, just outside Paris. By using regulations instead of treaties, Obama hopes to continue to cut U.S. emissions of greenhouse gases. When the world's first climate treaty was signed in Kyoto, Japan, in 1997, then-President Bill Clinton held an airport press conference to brag that the U.S. "showed the way" to make that happen. "I am very pleased that the United States has reached a truly historic agreement with other nations of the world to take unprecedented steps to address the global problem of climate change," Clinton said at the time. "The agreement is environmentally strong, and economically sound." But months later, the U.S. Senate said it wouldn't ratify that treaty, even if the rest of the industrialized world did. From then on, the U.S. didn't have skin in the game — and everyone else knew that. President George W. Bush agreed with the Senate decision. But he did say climate change was a problem, and one the U.S. should do something about. Speaking in 2007, Bush said, "I put our nation on a path to slow, stop and eventually reverse the growth of our greenhouse gas emissions." Bush didn't think those changes should come via a United Nations treaty. Rather than deal with the U.N., his approach was to suggest a target for U.S. emissions and encourage private companies to invent new technologies to meet it. When President Obama took office, he was eager to get the U.S. government to lead the world in the control of emissions. He had a "national climate action plan" to reduce emissions in the U.S., and, he said, the U.S. would return to the world stage. After addressing delegates at the U.N. climate conference this week, Obama told reporters, "Getting 200 nations to agree on anything is hard ... but I'm convinced that we're going to get big things done here." In 2009, he put in a personal appearance at the climate conference in Copenhagen, Denmark. 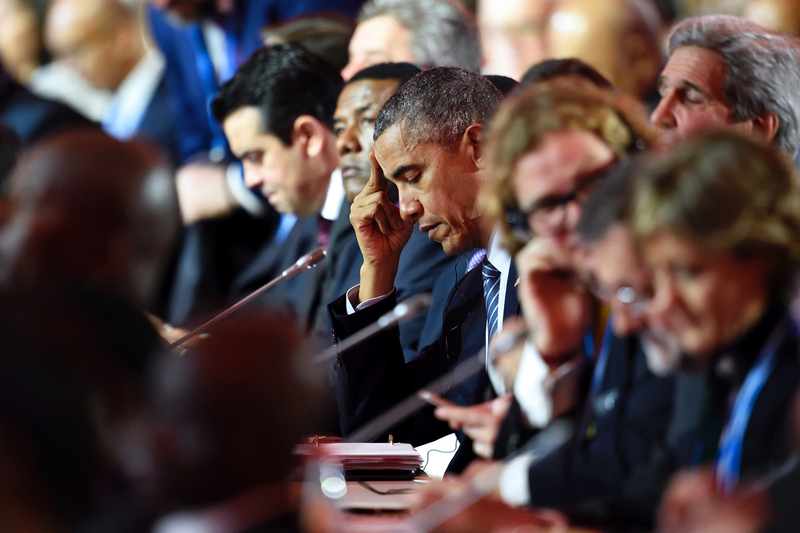 But that ended in disappointment; nations failed to agree on a new climate treaty. That same year, a climate action bill he supported died in Congress — one of several pieces of climate legislation to fizzle there. Republicans, especially, had doubts about the legislation Obama wanted. At a hearing on the bill, Rep. Ed Whitfield of Kentucky spoke for many of the doubters. "The way that this bill affects our production of electricity, and the production of the fuel we use in America, may very well dwarf the climate change problem," Whitfield said. Others just didn't believe what scientists were saying about the threat of climate change. At a Senate hearing in 2009, Sen. Ron Johnson, a Republican from Wisconsin, questioned NASA climate scientist James Hansen as Hansen tried to explain the geophysics. "I live in Wisconsin," Johnson told Hansen. "There were, I think, 200-foot-thick glaciers in Wisconsin. How do you explain that ... climate change occurred 10,000 years ago — before man had a carbon footprint?" There was one leading Republican back then who did believe climate change was a threat — Sen. John McCain of Arizona. That put him in the same pew as Democrat Henry Waxman of California; they both sponsored climate action bills that failed to pass. Waxman, now a lobbyist in Washington, D.C., thinks McCain felt pressure from conservatives. "He abandoned the whole idea about trying to do something about climate change," Waxman says. "And while he stepped behind the scenes on that issue, the Republicans went further behind and started to say that there was no such thing as climate change. They didn't believe in the science." So the Obama White House decided to make climate commitments on its own, without Congress. Waxman says the president actually always had the authority. "What President Obama needs to do for the United States to meet its commitments does not depend on an act of Congress," Waxman explains, "because he can rely on existing law." One of those laws gives the president the power to regulate fuel efficiency in cars and trucks. David Sandalow, of Columbia University's Center on Global Energy Policy, says the president went there first. "Within, I think, a couple of months of President Obama coming to office," says Sandalow, "he had broken an almost 20-year stalemate with respect to fuel efficiency standards for vehicles." After raising those efficiency standards, Obama directed the Environmental Protection Agency to turn its attention to power plants that make electricity. 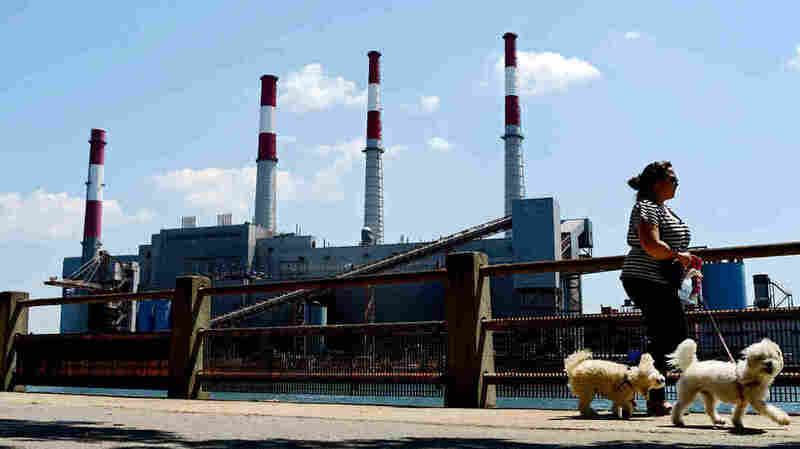 The Ravenswood Generating Station, in Long Island City, N.Y., uses natural gas, fuel oil and kerosene to power its boilers. "President Obama has pushed the Clean Power Plan, which [creates] the first limits on heat-trapping gases from power plants," Sandalow says. "And it's the single biggest and most important step we've taken to control greenhouse gas emissions." The power to do that comes from the mother of all environmental laws, the Clean Air Act of 1970. So, with the Paris negotiations underway, the White House has finally come to a position where it can lead by example, having reduced U.S. emissions already, and with plans to reduce them even more. Congressional opponents aren't just standing by. In recent weeks the U.S. House and Senate approved bills to overturn key regulations that limit emissions by power plants; the White House, in turn, has vowed to veto those bills, which don't have the votes needed for override. Still, Congress does have the power to set budgets — and that gives legislators the ultimate say over how much the government will spend on issues related to climate.